What’s in a GhostBed Luxe Mattress? What Can Be Used with the GhostBed Luxe Mattress? What’s the Weight Capacity of the GhostBed Luxe Mattress? Does GhostBed Offer a Sleep Trial, Return Policy and Warranty? How Much Does the GhostBed Luxe Mattress Cost? GhostBed Luxe is the next step. As the name implies, it is a sleek and luxurious version of its older sibling. The brand calls the GhostBed Luxe “the coolest bed in the world”—but is this accurate? That’s what we set to find out in the review below. 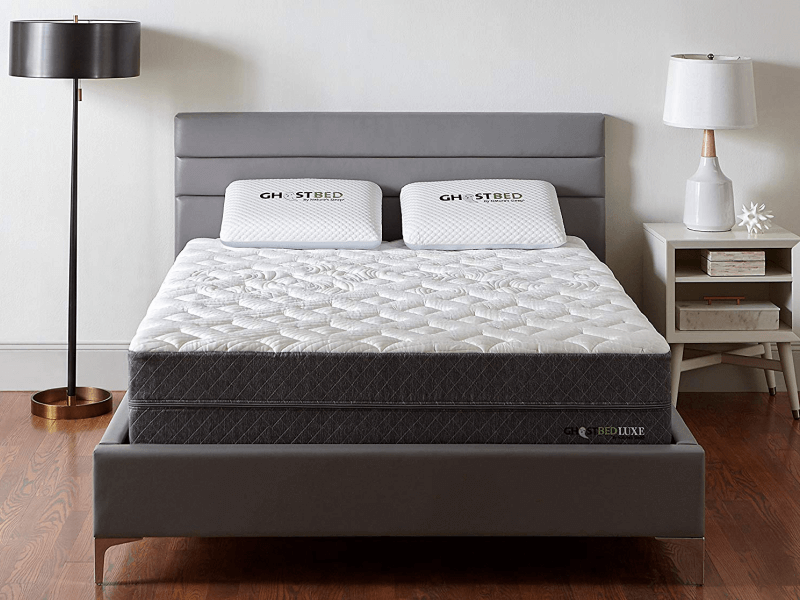 Read on to find out if the GhostBed Luxe is for you! Let’s get right to the heart of it. What is it about the GhostBed Luxe that justifies the claim that it’s “the coolest bed in the world”? The answer: two stages of advanced cooling technology that keep sleepers cool and comfortable all night. Stage 1: Surface Cooling. This is provided by a proprietary formulation called Ghost Ice, which we’ll discuss in more detail later on. This is woven directly into the fibers of the cover fabric, which helps absorb body heat quickly from sleepers, while keeping the bed surface cool. Stage 2: Core Cooling. Heat transfer from bodies to mattresses usually results in heat being trapped in a mattress core. Not with the GhostBed Luxe! A thin, end to end layer made of phase change material (PCM) sits right underneath the cover to help with that. This captures, stores, and neutralizes large amounts of the absorbed heat; keeping the mattress core cool and able to support more heat transfer. GhostBed mattresses are made in the United States, with all foams used CertiPUR-US approved. However, it’s important to note here that GhostBed doesn’t confirm the existence of any similar safety certifications—like an OEKO-TEX Standard 100, for example—for the newfangled fabrics and materials. We did reach out to them about this, and a helpful customer support representative assured us that the materials don’t use harmful chemicals and undergo rigorous safety testing. Now that we know all about the next level cooling properties of the GhostBed Luxe, let’s dive in and take a good look at what’s inside it. 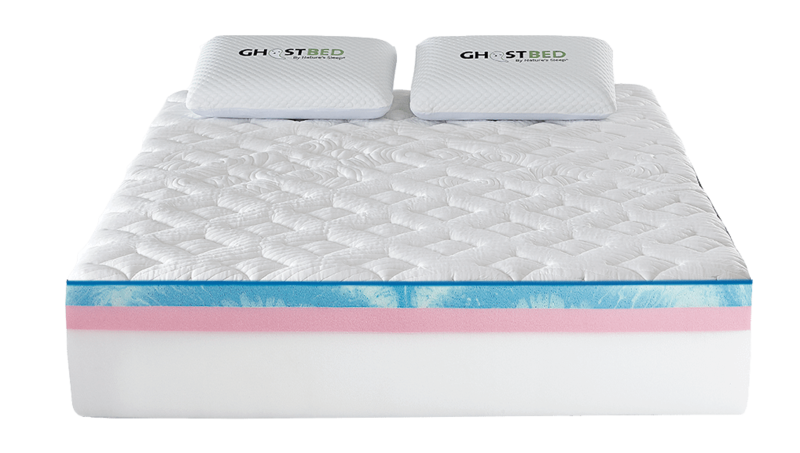 Here we will discuss the proprietary formulation and the PCM in more detail, and go through a top to bottom breakdown of the seven layers in the GhostBed Luxe. Ghost Ice fabric. The cover is smooth and cool to the touch. As mentioned above, this is a fabric blend with the Ghost Ice woven into its fibers. GhostBed identifies Ghost Ice as a Japanese application of thermo-sensitive technology. Ghost Ice senses and automatically absorbs heat in order to adjust the balance of temperature. This is to maintain a neutral sleeping environment—keeping the sleeper cool, but not cold. 0.5 inches of cooling fiber. This layer underneath the fabric is added to encourage air flow. It add a little bit of a cozy and plush feel, too, especially when combined with the foam right underneath it. 1 inch of gel memory foam. This quilted-in foam gives you an initial taste of contour and pressure relief. GhostBed calls it the “GhostHug” feel. Gel memory foam is also known to be a great material for absorption and dissipation of heat—especially when it’s near the surface of a mattress and exposed to air. Ghost Ice layer made of PCM. This is a very thin and thermoregulatory gel layer that is added to help with mattress core cooling. This technology is not new, and has been used in everything from textiles to building construction materials. We will concede, though, that this is the first time we’ve reviewed a mattress utilizing it. 2 inches of gel memory foam. This is the same kind of foam that is found in the GhostBed Luxe cover. As such, it provides the same main properties—cooling, contour and pressure relief—but on a bigger scale. This part is what many would think of as the core and comfort layer of the mattress. 2 inches of Ghost Bounce foam. A proprietary foam that’s again unique to GhostBed, the material is soft but responsive. It combines the best features of memory foam and latex; and is supposed to simulate a feeling of floating, or a proper hug without too much sinkage. The Ghost Bounce foam also acts as a transition between the soft memory foam and the durable support foam. 7.5 inches of high density polyurethane foam. This is par for the course when it comes to mattresses. A firm and durable bottom layer of foam provides structural support and longevity to the mattress, as well as deep compression support to sleepers using it. The seven layers add up to a thickness of 13 inches, which is another mark of the luxurious nature of the GhostBed deluxe. Industry average mattresses usually sit in the 10- or 11-inch range. Can You Customize the GhostBed Luxe Mattress? The GhostBed Luxe mattress is available in several US standard sizes: twin, twin XL, full, queen, king and California king. Some sizes may not be available if you purchase through anywhere other than the official website, though. 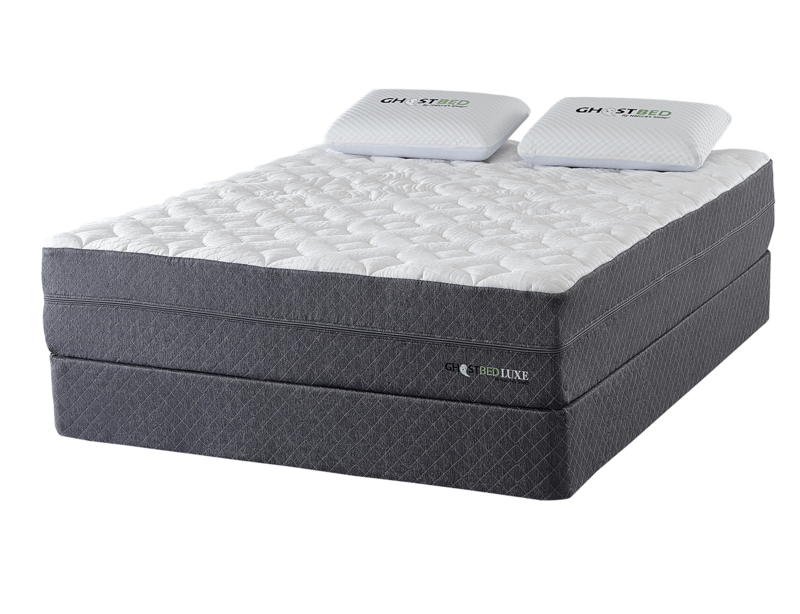 For example: As of this writing, Amazon only lists twin XL, queen, king and California king sizes for the GhostBed Luxe. No other customizations are possible. No other covers or comfort levels here—although GhostBed does provide replacement covers, should you need one. Just contact their support team if so. The weight of the GhostBed Luxe ranges from the twin’s 76 pounds to the California king’s 149 pounds. The queen size is 122 pound. This puts the mattress on the heavy side, with comparable bed-in-a-box luxury mattresses being usually being a little lighter. Let’s start with what we don’t like about the GhostBed Luxe first. While we like that it’s sturdy and solid, it is also very heavy. Once it’s set up and decompressed, it will take a lot of strength to rotate or transport it. This bring us to our point: Why are there no side handles? This fairly minor addition really would have helped. We also have qualms about the proprietary technology they’re using for the advanced cooling properties the GhostBed Luxe is known for—but after aggressive researching, we really couldn’t find anything alarming about it. We suspect that Ghost Ice also uses some form of PCM—as this technology is very well known for temperature regulation—but we can’t be sure. Product safety certifications would be nice, but a helpful and transparent customer support team does a lot to ease our worries. Now for what we like: Is it fair to say “everything else”? When you sleep hot, the struggle is real! You end up tossing and turning a lot. Some things we’ve experienced because of sleeping hot: Throwing off blankets while asleep only to wake up freezing, waking up sweaty and sticky during the summer, and leaving icky sweat stains on sheets. With the GhostBed Luxe, sleeping hot will be a distant memory. What a blessing. Lack of side handles aside, the do love the mattress cover. It’s properly sturdy but plush at the same time, and it looks good with the quilting and the understated color combination. It’s easy to spot clean because it’s removable, too. As with every mattress, our wish is for the cover to be machine washable; but we know that this is a difficult ask. GhostBed proudly states that the GhostBed Luxe fits every bed frame, from box spring foundation to adjustable base. Even slatted frames are allowed, though we do encourage you to contact customer support for more information on this. Slats typically need to be a set width apart to support certain weight ranges. Have a bit of extra cash and looking for maximum product compatibility? You can check out GhostBed’s other bedroom products. The GhostFoundation (Check deal on Amazon) may be your best bet for a bed frame that will 100% comply with the brand’s warranty conditions. The GhostProtector (Check deal on Amazon) provides waterproof protection so you will rarely have to worry about spot cleaning your GhostBed Luxe mattress cover. Enjoying the maximum cooling effect of the GhostBed Luxe? That same technology is present in the GhostPillow (Check deal on Amazon). How Do You Set Up the GhostBed Luxe Mattress? The GhostBed Luxe is a mattress-in-a-box purchase, and like any other of this kind, expect it to be delivered straight to your doorstep. That’s it! Nothing more, nothing less. There’s no old mattress removal or white glove delivery service offered here, like with other brands. Once it arrives, you can keep the GhostBed Luxe in its delivery box for up to six months before unpacking it. More than that and the compression may start to affect its structural integrity. Nothing special about the unboxing, either. Simply lay the compressed mattress on the intended sleeping surface, and then slowly start to remove the plastic packaging material. Arrange it properly on the frame doing so. When all of the plastic is removed, the GhostBed Luxe will start to fully decompress. You can remove all the packing material from the room at this point. Open a door or window, too, for better ventilation. Because this is a foam product, they may be “new mattress smell”, but it should dissipate without any lasting mark. It may take anywhere from a few hours to a few days to reach its actual full size. Like the flagship GhostBed, the GhostBed Luxe supports an overall weight of 750 pounds. This means that two people weighing 375 pounds each can rest easy knowing that the mattress they’re sleeping on won’t bottom out. This also works for families with young children that may sometimes want to sleep in the same bed with their parents! Couples who let their large pets sleep on the bed may also find this weight limit a good incentive to choose the GhostBed Luxe. Important to remember, though, that GhostBed also recommends using a strong foundation if one or both sleepers are above 300 pounds in weight. Since this is a fairly new product, there’s not a lot to go on in the way of customer reviews unless it’s on the official website. 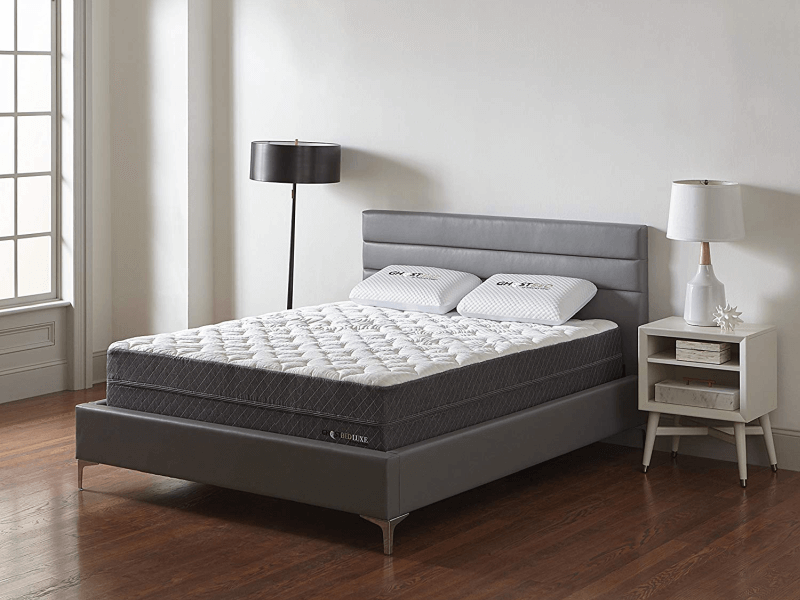 We have seen some negative feedback mentioning that the GhostBed Luxe is too firm for them, but we see that for almost every mattress we review. As of this writing, we’ve seen no complaints about it being too soft. According to GhostBed, their GhostBed Luxe sites in the middle of a scale going from plush to firm. The promise is to give sleepers that plush and luxurious feeling while still providing excellent support for alignment and spinal health. The bulk of the overwhelming amount of positive feedback praises the advanced and extended cooling nature of the mattress. There are a lot of anecdotes about people that have slept hot their entire lives finally getting a proper night’s sleep. GhostBed may seem like a new kid on the block, but as we’ve covered in the introduction, they’re actually backed by an established parent company. This is great news for consumers, because it adds a measure of relief when complicated mattress designs and materials are involved. We’re more likely to believe it when customer support representatives say that quality and safety are assured. We also covered this next bit in our flagship GhostBed review, but we’ll mention it here in passing, too. GhostBed is a defendant in a lawsuit filed by competitor Purple. It’s a developing story, and in no way does this news affect our review of both GhostBed and Purple products. We’ve included this information in the review simply to express that tangentially related news should not affect how you assess a product. How Is GhostBed’s Customer Support? If there were anything we could rave about more than the cooling properties of the GhostBed Luxe, it would be this. GhostBed’s customer support is extensive, transparent and extremely patient. They have a well-written FAQ, a telephone hotline and multiple social media accounts that are all very active; but the easiest and most direct way to get help is to contact them through live chat. It’s available on their official website, and pops up automatically when you visit. We had so many questions about the Ghost Ice and PCM technologies—and them some more after that—and GhostBed’s customer support representative rose to the occasion. Never once did we feel that we were being rushed or being given a template response. There was no obvious upselling, either. 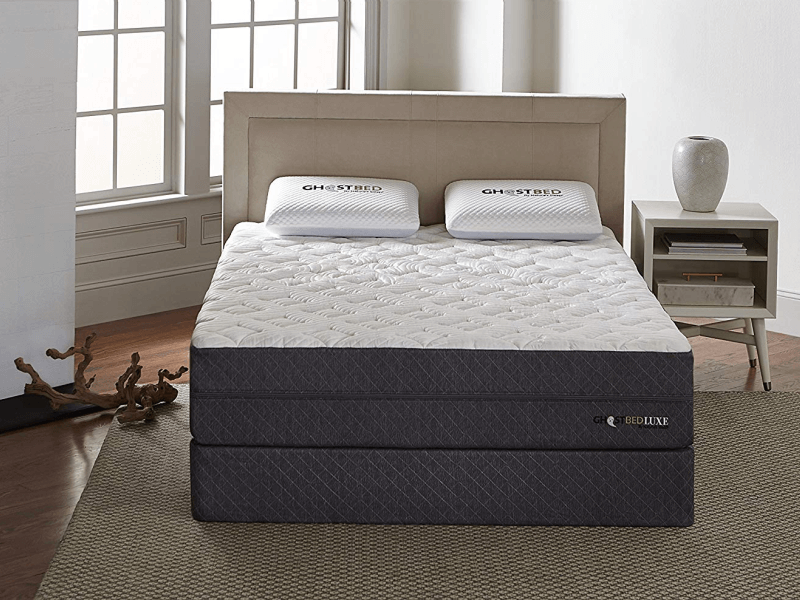 GhostBed offers a 25-year mattress warranty for the GhostBed Luxe. This is five years more than the warranty it provides for the flagship GhostBed. Remember, though, that mattress experts and sleep specialists often recommend replacing daily use mattresses every 10 years. This is both for health and hygiene reasons. A very long warranty period may be industry leading and very impressive sounding, but it’s really only a bit better than industry standard. There is a 101-night sleep trial for all GhostBed mattresses. Note that the trial starts upon mattress shipping and not when upon delivery. We previously noted in our flagship GhostBed review that the sleep trial and return policy are only honored for purchases made through the official GhostBed website. We’re happy to say that this is now not the case. Should you order a GhostBed Luxe through Amazon, you will still be able to avail of the generous sleep trial and return policy. As of this writing, the queen-sized GhostBed Luxe mattress is $1275 on the the official website. It is slightly more expensive on Amazon, at a little bit over $1,375. Also: Sales to Hawaii and Alaska are final, which we think means that the sleep trial doesn’t count if you’re having the mattress delivered there. Yes, it is pricey; but it is also very much a luxury mattress. Don’t let the all-foam construction fool you! Most mattress-in-a-box luxury hybrids focus on plushness and sheer thickness. The GhostBed Luxe focuses on cooling, with five of its seven layers providing some sort of temperature regulating effect. We think that if that’s what you’re looking for, the price is justified. We’ll be honest: We weren’t huge fans of the original GhostBed, but the GhostBed Luxe has made us appreciate what this brand has to offer in terms of innovation and constant development. We LOVE that the GhostBed Luxe focuses on making the bed cool and comfortable, as well as plush and cozy. However, what we love the most is that this review has opened our eyes to the changes GhostBed has been making behind the scenes. Their customer support has always been good, but our experience recently has proved that they’ve gone from good to phenomenal. Also: Now you can purchase a GhostBed mattress on Amazon and still avail of the brand’s sleep trial and return policy. That’s a massive improvement, as misunderstandings due to this were the cause of much frustration and negative feedback when they were starting out. The GhostBed Luxe is a definite step up compared to the flagship GhostBed! No hesitation here. If you can afford it, by all means, try it out.